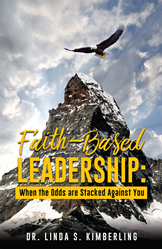 Former government executive Dr. Linda Kimberling outlines seven biblical principles for management in Faith-Based Leadership: When the Odds Are Stacked Against You ($14.99, paperback, 9781545653685; $23.99, hardback, 9781545653692; $7.99, e-book, 9781545653708). Her book provides practical advice for authority figures wishing to lead with integrity and follow God’s plan in a world where leaders are taught to be unscrupulous and ruthless in order to make it to the top. Kimberling provides practical examples of the moral dilemmas a Christian leader can face in a secular workplace, along with biblical answers to those dilemmas. “Christian leaders feel isolated, alone, and ill-equipped to survive in today's corporate culture of corruption, deception, fraudulence, and illegality. But, God's Word outlines His Way to lead with honor and conviction in all circumstances,” said Kimberling. Dr. Linda Kimberling spent 30 years working in managerial and executive positions with the U.S. Government. She also served on the faculty of Southern Illinois University and Regis Jesuit University for 10 years. Her PhD is in Organizational Management, specializing in Leadership. Xulon Press, a division of Salem Media Group, is the world’s largest Christian self-publisher, with more than 12,000 titles published to date. Faith-Based Leadership is available online through xulonpress.com/bookstore, amazon.com, and barnesandnoble.com.